I have now had about 15 months trying various LED headlights powered by my dynamo hubs, and want to offer some impressions. LEDs with good reflectors are real "game changers" for night time cycling, and keep getting better and better. The Supernova E3 Pro is my favorite. The Busch + Mueller Lumotec IQ2 Luxos U failed after one ride in the rain, so earns a failing grade. In thinking about which lights to try, I have relied on two online information sources. First, there is a good, practical set of English language online comparisons from a website in the Netherlands, here. I pretty much agree with what that author says, and his photos of various beam patterns are useful. 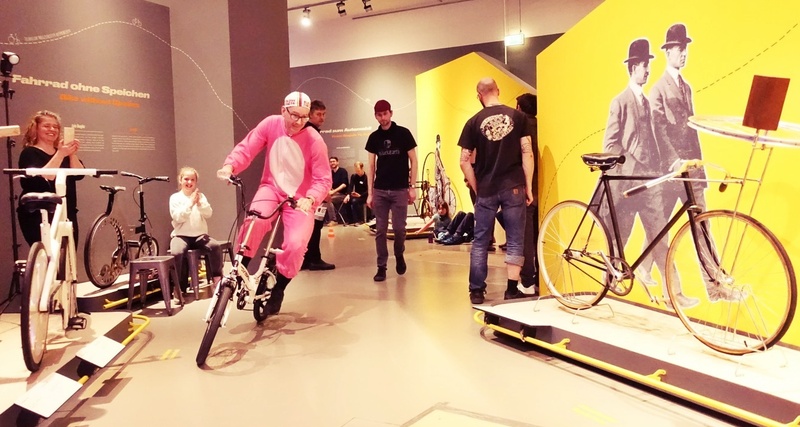 Second, there is Peter White Cycles in the U.S. He is the U.S. distributor for SON dynamo hubs and the Edelux lights, among others, and his website has his take on the requirements for lighting, as well as photos of lots and lots of lighting beam patterns taken down a pitch dark road in the New Hampshire night. The photos are very useful. 1. These LED dynamo lights generally include both wires to connect to the hub for power input and also separate wires for output to an LED tail light. I have never bothered with dynamo powered LED tail lights, since my Panasonic rechargeable Eneloop AAA batteries and rear lights will last weeks or months set on flashing mode, and even on a constant-on mode (as required by most Audax events) one set of freshly charged batteries will make it through all or most of a 1200km ride. 2. There are now lots of Japanese LED headlights for use with dynamo hubs, but they are generally for use with shopping bikes, light only the near field and not way down the road, and look ugly. At this point, stick to the European (primarily German) products for the best lighting. 3. The nicest looking lights by close to consensus opinion are (1) the Supernova E3 Pro and (2) the Schmidt Edelux. 4. It is not easy to compare lights. Some lights include "Lux" ratings. Others are rated in "Lumens". (Lux = 1 lumen per square meter, and so takes into account the area lit as well as the output of the LED. Others have the same brightness in theory, but seem to use more or less efficient LEDs and so get bright at lower/higher speeds. Others seem to dim somewhat after the LEDs heat up fully. 5. Brightest is not always best. If you plan to do trail riding in pitch dark, you want the brightest light and widest beam you can find. 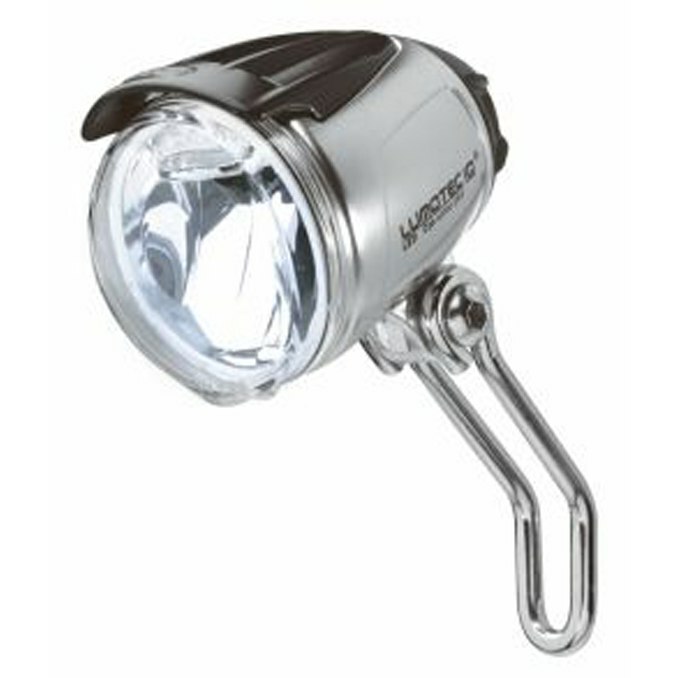 But for most on road riding, you may want a light that draws less power and provides enough light. And you do not want to blind drivers coming toward you. I do not need an E3 Pro Triple. I find the E3 Pro offers plenty of light and a good beam pattern. Then again, I might want more light if I was on a fast descent in rain at midnight, or if I had poor eyesight. 6. Get a light with cutoff switch. The lights designed for bottle (rim) dynamos are "always on", since you turn them off by lifting the dynamo from the rim. For a hub dynamo, you definitely want a cut off switch so you can reduce the dynamo's drag during daylight hours, or use the current to charge a USB device. Which lights have I tried? 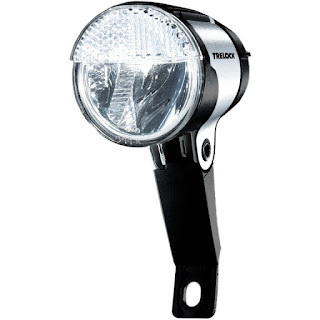 This 60 Lux light has a beam that throws plenty of light in the distance, but notably also has a very bright, wide near field beam, just around the front of the bike on left and right sides. This can be useful, especially at slow speeds and in the city, but also is a bit distracting on long rides in the country at speed, with light shining off the front tire and the ground around you. It is affordably priced (around 60 Euros last time I checked). It has a reflector along the front of the mount. And it fits nicely behind the front road brake mount. There is also a 40Lux version -- plenty for most uses. Unfortunately, the mounting tab snapped off at its base an hour or two before the end of the Rocky Mountain 1200 last summer. I descended a steep hill (on a sunny afternoon), and I think metal fatigue plus intense vibration of the Canadian rumble strips snapped it off. So I cannot give an unqualified recommendation. Then again, I was given a refund (still within initial one year warranty period). And even if the warranty had not covered it, I could buy two or three of these for the price of one Edelux or Supernova E3 Pro. This is another relatively reasonably priced light. It is 40 Lux, and I used it on the October 2012 600km Brevet I rode with Jerome, as well as keeping it on my Canyon road bike since. The Trelock had plenty of light for an overnight Brevet on Japanese paved roads. And it also fits nicely behind a road bike front brake mount. It is not the most beautiful of lights, but it is reasonably priced. My main complaint with it is that the beam pattern has a sharply defined area and lights only a relatively narrow area of road in front. This was a major detriment as I descended the North side of Tsuru Pass just after dusk on the Brevet last October. I could not see the road in front of me as I twisted through turns and the beam lit the corners that I turned through, rather than the road I was turning into. And once I hit a straight away and really accelerated, I could barely see anything outside of the beam's defined edges. I almost hit a deer, descending at over 50 kph speed. Really. At least I think it was a deer. I smelled it just about the same time that I saw its shadow. Busch & Mueller has a dizzying number of different models with different characteristics. There is something for everyone. Be very careful when you order to make sure you get the right one. The first I ordered, in 2011, lacked a cut-off switch, and so is on all the time, unless you unplug it at the hub. (Jerome has been using it since without complaint). B&M have 60 Lux models that they advertise as 500% of the brightness required by the German regulatory scheme. The 60 Lux plastic model is around 50 Euro. I have been using a 40 Lux version (300% brighter than required) that has some brushed aluminum mixed in with the black plastic, instead of just black plastic, and is costs just under 60 Euro. I could not bring myself to get the true retro-styled, more expensive and only 30 Lux "Classic" version. I have been reasonably happy with this light so far, using it mostly on my fixed gear bike for night riding in the city. The beam is relatively close to the Trelock ... but offers just enough more leakage outside toward left and right sides in order to make on aware of nearby obstructions. With this light I would probably have seen the deer. E3 Pro with multimount, and wires for tail light wrapped around the mount (eventually I should cut them off as I am unlikely to use them and they detract from the aesthetics). The Supernova E3 Pro is much more expensive than the lights above (it is around 140 Euros). It is a thing of beauty, feels solid, and comes with either a handlebar mount or a "multimount" that fits well with a V-brake and a cyclocross style fork. It does not fit with a road fork/brake absent another adapter. Of course, it is also possible to mount with an axle extension (such as Velo Orange offers in the U.S. or I have found in Japan), but this kind of low light position usually results in too much lighting of the near road and not enough in the distance. I like the beam pattern. 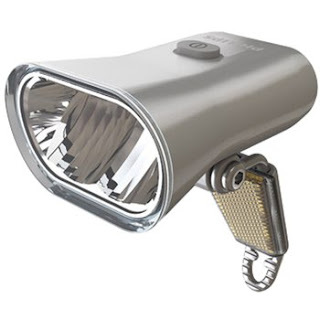 Unlike the Busch & Mueller and Trelock, which have an LED at the top front of the light, which shines indirectly off the reflector and out onto the road, the Supernova LED is in the rear of the reflector and shines both directly and off the reflector. The beam is not as sharply defined as my B&M or Lumotec, but rather gradually dissipates at the edges. And my version of the E3 Pro has a "Terraflux" reflector, designed to spare the eyes of drivers just like a "low beam" auto headlight. Even so, just enough light expands to see a reflective highway sign overhead. I used the E3 Pro on the Tohoku 1700 rides last May and again on the Brevet I did last weekend. I expect that I will use it a lot in the future. I do not have a Schmidt Edelux, though have heard that they are great -- very attractive and perhaps lighter weight and slightly less expensive than the Supernova E3 ... but they use a Busch & Mueller style reflector, and so I somehow find it hard to pay 120 Euros for the Edelux instead of 50 or 60 for the B&M. The other light I would like to try is the new Busch & Mueller IQ2 Luxos B or Luxos U. As you can see on Peter White's B&M page, and from his beam photos (worth scrolling way down the page to see these) this has a very bright LED (70 Lux), with a very wide angle beam. But unlike the Philips Saferide, the near field is not overly brightly lit so as to distract or make it more difficult to see further down the road. And the Luxos U includes a built-in USB charger for iphone, Garmin or other accessory. What's not to like? Well, in the catalogue at least it looks ugly, and it probably draws more current (and creates a wee bit more drag) at the dynamo hub than is necessary in many conditions. NOTE: Price information is from Bike24 website, excluding VAT and shipping charges. I purchased a Busch + Müller LUMOTEC IQ2 LUXOS U in late April 2013 and tried it on its first real ride on the May 11 400km Kanagawa brevet. 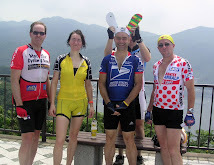 We rode through rain off and on the first 14 hours of the ride, but I was using fenders and riding on decent quality Japanese roads ... relatively smooth, with only limited standing water ... I had no problems with the light during the event. And though I lacked a side-by-side comparison, the light was definitely bright, brighter than my others and with a noticeably wider beam than any, with the possible exception of the Philips Saferide 60 Lux. The light came with instructions describing the sophisticated electronic controls, Li-Ion cache battery, USB charger, temporary "floodlight" feature, ... and warning about water getting inside the light's electronics from the bottom/rear, and not to use the USB charger during rain. I had fenders on my bike during the Brevet, so the light (and my frame) were protected from the worst water ... and indeed my bike and I looked relatively clean at the end of the ride, compared with other similar rides taken without fenders. I left the USB charger socket plugged the entire ride -- never once even testing the feature. ... But when I next tried the light a few days later, it would only flash on and off. And when I took an hour test ride on Saturday, the battery would not charge, the light would not light. And I can see water condensation on the INSIDE of the light's lens. I have sent a note requesting a return/refund. A quick check online finds at least some other riders have had the same experience, or other problems. I am glad I tried this light on at least one rain-filled event before London-Edinburgh-London, and I feel luckly that it did not fail and require me to use my back-up when I was many hours of darkness away from access to enough spare batteries. For now, I will stick with lights that do not have a lot of extra features, and that emphasize durability and reliability. If I want to use my dynamo hub for USB charging, it will not be via a system that compromises the core function of lighting. I should note that Busch & Mueller (via Bike 24) did give me a full refund for the light. 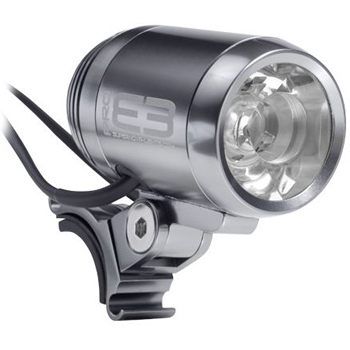 Also, B&M is a leader in bicycle lighting, has some great products, and I know some other riders have taken the trouble to further waterproof the wiring/leads and other potentially vulnerable areas of their LUXOS lights and seem happy with them so far. UPDATE May 2013: There is a new Supernova E3 Pro from sometime last year, the E3 Pro 2. Based on reviews it seems an incremental improvement over the version I have, but basically the same. I have purchased the attachment required so the E3 Pro fits on a road bike mounted behind/above the front brake. The E3 Pro has a much more flexible adapter than most other lights, and so I can swing it so that it protrudes out, just a few centimeters above my front wheel and fender. This gives a lot of clearance for me under my Ortlieb Ultimate Classic 5 handlebar mounted bag ... much easier to use with a handlebar bag than the other lights in this review. UPDATE August 2013: A commenter points out that AXA (not the insurance company, but a Dutch bicycle lighting company) now has a dynamo powered headlight with USB charger incorporated, which made it through LEL without incident. Their website is here ... looks as if they have several models (50 and 70 Lux). Prices look reasonable, for a light with many of the features of the Busch & Mueller Luxos. Any others have experience with this? UPDATE January 2014: Just got the IQ2 Eyc T Senso Plus. Looks like a great light. See my post here. UPDATE January 2014: Someone pointed out to me the new Magnic lights -- powered by a "touchless" dynamo that sits very close to the rim. See a review here and article there. These lights are not quite ready for prime time, but within the next iteration (adding a stand light and somewhat brighter) might be a great option. I have not seen any real tests showing the light on/off resistance generated by the magnets, as compared to a hub dynamo. Of course they are more efficient than a sidewall dynamo ... They do point out the possibilities for lower power, lower resistance dynamos as LEDs get more efficient and systems begin to integrate the latest in both dynamo and LED technology. Excellent post that will become a good reference- well written David. As I still haven't built up a wheelest witht the SP dynamohubs I am using the B&M IXON IQ (http://www.bumm.de/produkte/akku-scheinwerfer/ixon-iq-speed.html)with a rechargeable battery pack.I am pretty happy with the light although I have to admit that I don't have any comparision. I also don't bother too much about the rear light. I am now using a pretty fancy one with laser beams running on batteries (http://cyclitis.wordpress.com/2012/09/30/24-stunden-von-osnabruck-und-bremen/). I fully agree with the statement about Busch & Mueller; there seem to be avery engineer-driven company; good products but it is very difficult to find out what one exactly needs and what the differences between the various types und models are. Thanks for the feedback on the various models. I do understand that Busch & Mueller have addressed the problems with the Lumotec IQ2 Luxos, well I hope so as I am intending to fit one in the next month. I will be marrying it up to a Shutter Precision PD-8 dynamo so will be interesting to see how it works out. The rear light is likely to be a Busch & Mueller Secula Plus for Seat Post or Stay. Any experience with those? A great resource, thanks a bunch. Busch and Muller still have problems with water ingress into their Luxos IQ2 U, even the modified version. I have 2 of these and both have suffered water ingress. The first was during a 200km audax, light rain, standing water, but my bike has full mudguards. Rain flicked up from riders infront penetrated the lamp housing, leaving dirty marks on the inside of the lens, reflector and over the LEDS, plus condensation. Have cleaned the effected parts and used insulation tape to seal between the top of the lens and the lamp body, where I believe the water got in. My second unit has suffered water ingress at the handlebar mounted switch, during this weekends 400km audax. This has resulted in the pulsing on and off of the head light and the rear light, that is connected via the rear push on connectors. I know it is water in the switch, as I can see bubbles being formed at the join in the switch body when I depress the switch. Thi slight is totally unusable in its current state. Currently the retailer in Germany is only offering repair or replacement, however I am pushing for refund. I am based in the UK and they seem to only offer refunds to customers based in Germany.